I make a batch of hummus every month and freeze it in portions, so we always have hummus available, it's my husband's favourite filling for his lunchtime sandwich. 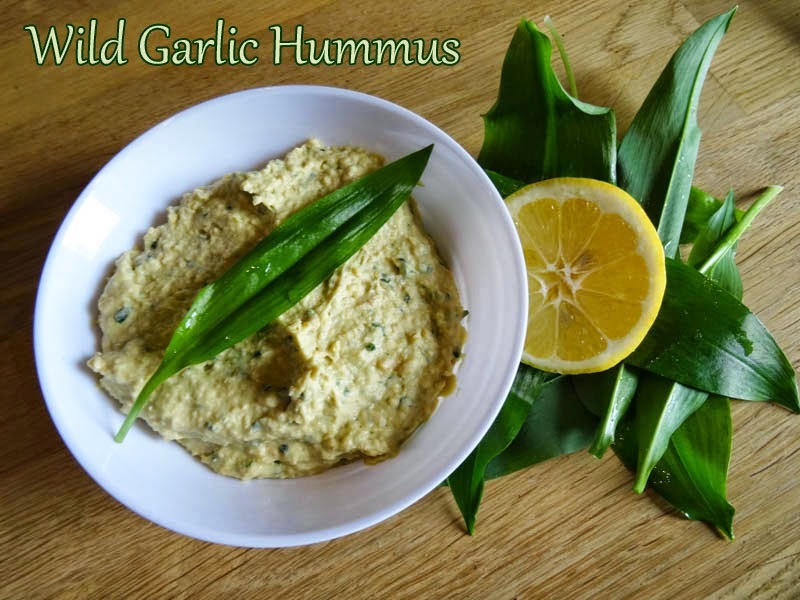 I was looking for ways to use the wild garlic I had picked and, as hummus contains garlic, I decided to try making it with wild garlic. Sometimes I forget just how fortunate I am to live in the country, mostly in the cold dark days of winter. However, I am reminded of the joys of country living in spring when everything starts to grow again. Close to where I live there are some woods with a burn (stream) running through them and this is my favourite place to walk. 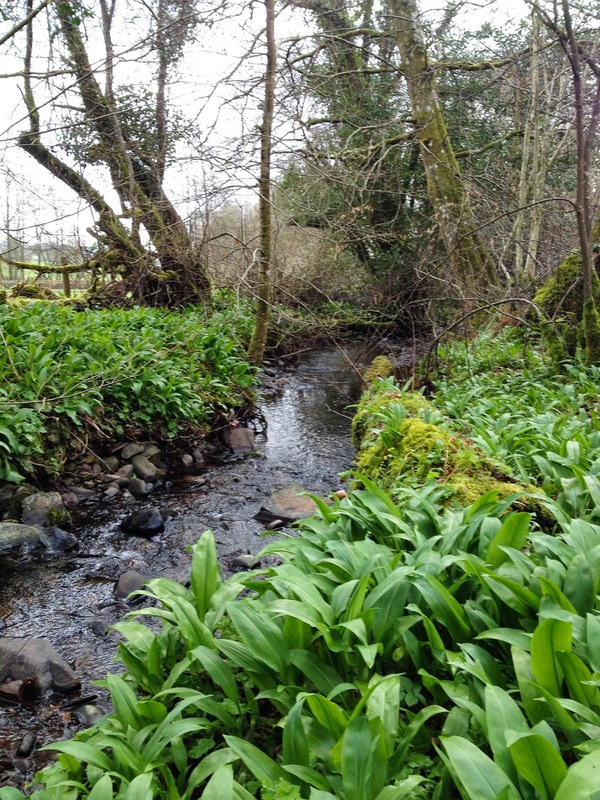 This year the Wild Garlic (Ransoms) have gone completely berserk and are covering the roadsides as well as the side of this little waterway. 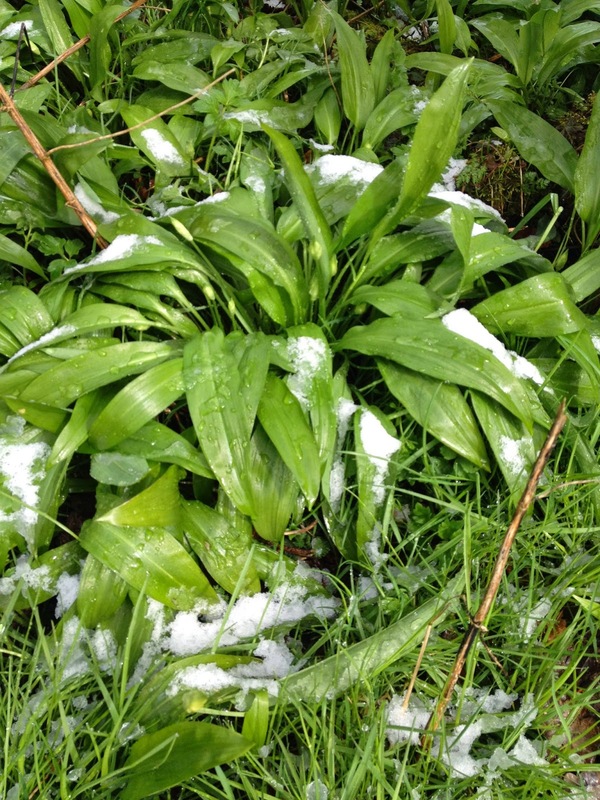 We even had a late flurry of snow this weekend but you can see that the flowers are nearly ready to pop on this particular wild garlic plant. Put all the ingredients into your food processor and process. Add cooking liquid or water until you have the thickness and texture you prefer. If you ask how best to preserve foraged wild garlic you will find many people will direct you to make pesto. So I did! 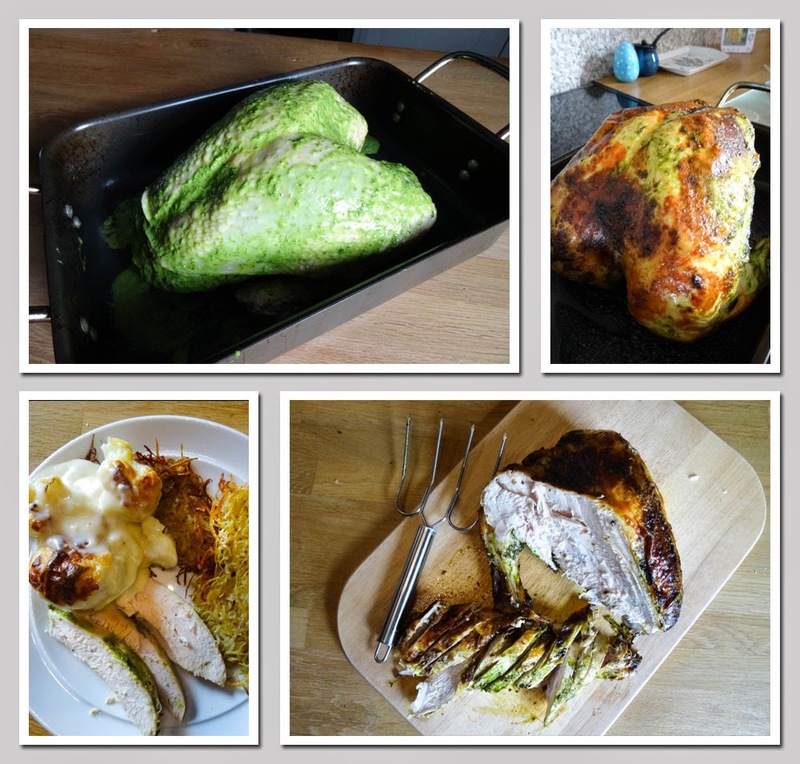 It has a stunning colour and an intense flavour and you can freeze it for later. Place all the ingredients into a blender and blend until smooth. 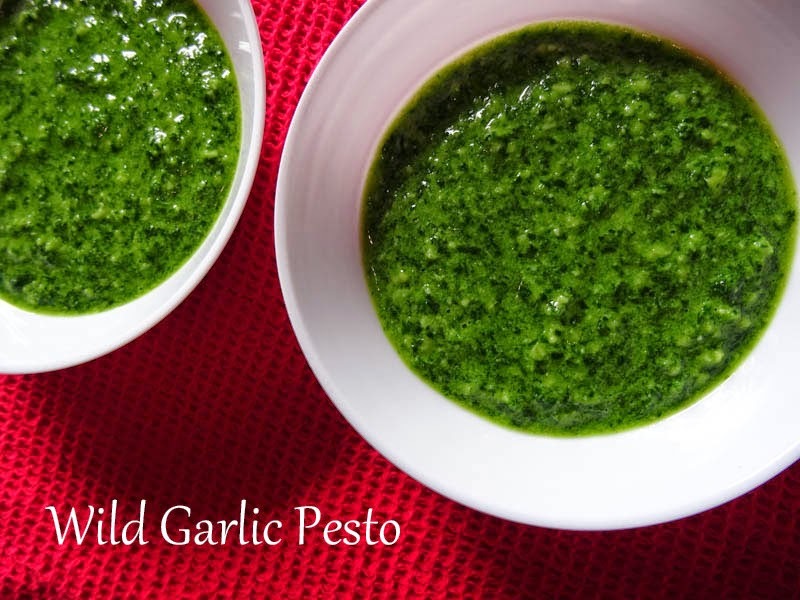 Serve with pasta, risotto or however you would usually serve pesto. It looks a bit lurid when you first rub this mixture over your chicken or turkey, but it mellows down once cooked and and adds a subtle garlic flavour to the meat. Roughly tear up the wild garlic leaves and put them and the rest of the ingredients in a blender and whizz until smooth. Loosen the skin of the chicken or turkey breast and rub some of the mixture under the skin, directly onto the breast meat. Then rub the rest of the mixture over the whole bird. Roast breast side up for 20 minutes at 180C, then turn over and roast for the time appropriate to the size of your bird to make sure it is cooked through. Test by piercing with a skewer at the thickest part and the juices will run clear when it is cooked. A very simple dish but one which really makes the flavour of the wild garlic the main feature. Beat the eggs and water together and season with salt and freshly ground pepper. Melt the butter in the omelette pan (I actually keep a pan only for omelettes but any good pan will do) on a medium heat until it starts to sizzle. 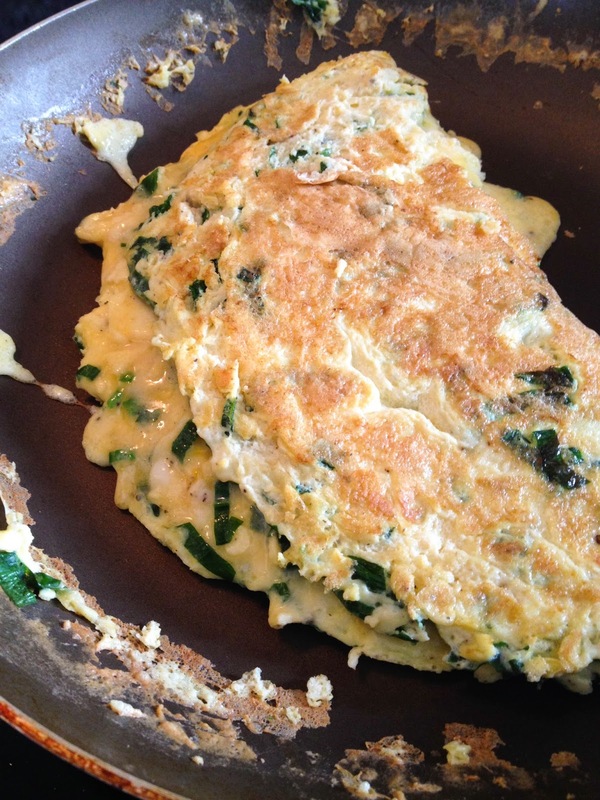 Pour in the eggs and as they start to set push the outside edges towards the centre and tip the pan to all the uncooked egg on top to fill the gaps, do this for about 30 seconds then add the wild garlic leaves. When the egg is almost but not quite cooked, Fold the omelette over onto itself , there should still be a soft oozy bit in the middle. Serve with brown bread and butter and a green salad. 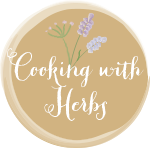 I hope you have enjoyed this foray into the world of foraged food and you are encouraged to seek out some wild food for yourself. Please be very careful what you pick and where you pick it from, getting someone to show you which plants are safe is the best way to learn. Lovely, I made soooooo much pesto with my Wild Garlic, wish I'd thought to make Hummous with it though! Bet it's gorgeous?.. It is very good and I love the look with the little flecks of green. Lovely post- just got some wild garlic so looking forward to try the hummus! I have a wild garlic craze at the moment too! I was thinking of making some hummus next with it so will use your recipe, thanks. OMG OMG I am SO making wild garlic humous and wild garlic pesto when I go home next weekend! It is SUCH a huge bonus living in the countryside, I have my secret stash that I go visit in April and I cannot wait... your humous looks superb! It's so addictive, isn't it? Glad you liked the recipe. Aw thanks Kelllie. 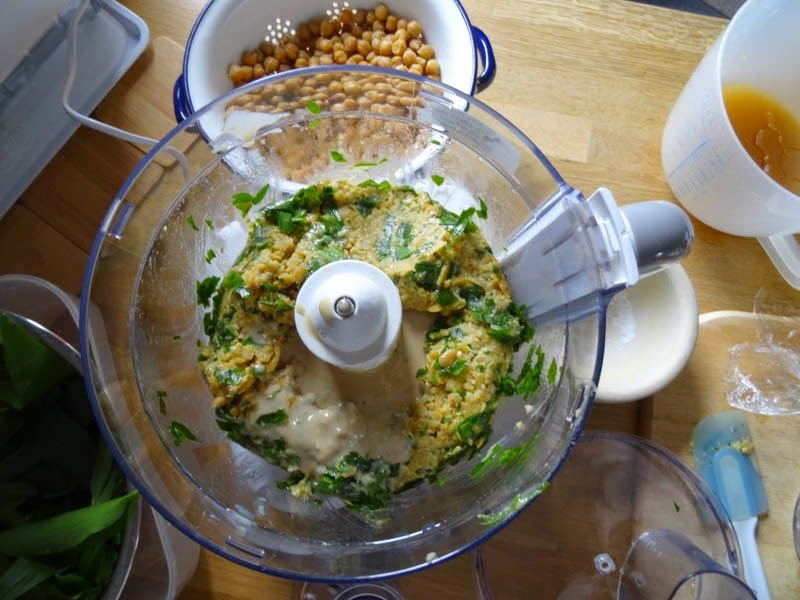 If you look carefully at the picture with the food processor you will see the jug of jellified chickpea cooking water that I mentioned on your mousse post. Thank you and get foraging Dom, we have to make the best of our country larder! Ooh I'm planning on going foraging this week. I also bought an incredible wild garlic sea salt - huge flakes of salt with wild garlic strewn through from a brand called Falksalt in a local deli yesterday and it's amazing. Your recipes have seriously made me drool tonight. OH YES this looks gorgeous! Oh yum both the hummus and pesto sound great Janice. I haven't been lucky enough to find a path of wild garlic yet. Maybe I just don't know what I am looking for. Thank you, the salt sounds really interesting. Thank you Sarah, I agree about the garlic! That's lovely to hear, I hope you enjoy it. You are welcome Karen, I get very excited by free food! Thanks Jac. it's easier to identify once the flowers come out as they are very onion like flowers and you can smell the garlic as you walk past. Then you just have to remember where they are for the next year as the leaves are better when they are young before it flowers. Woods and boggy wetlands seem to suit it best. Oh a plethora of lovely wild garlic recipes! There is nothing like free food! I love the hummus and of course you can freeze it - I have no idea why I don't do this! 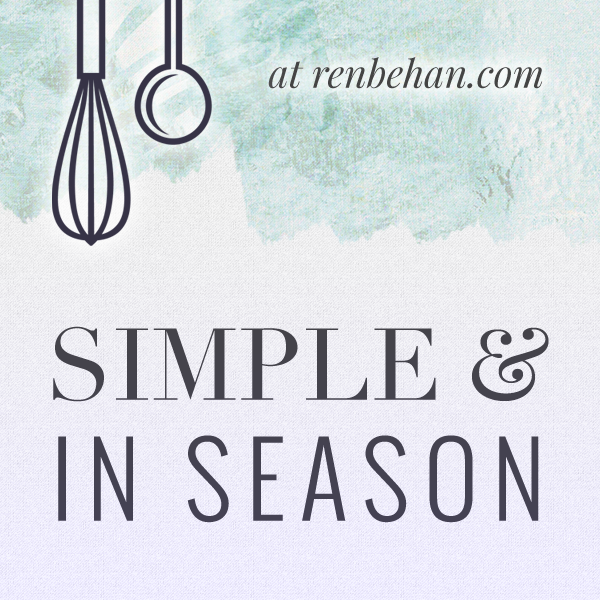 Thanks for linking up to Simple and in Season.